FIGURE 6 Visualization of a quadrature filter (Hilbert transform pair) used in the estimation of local anisotropy. 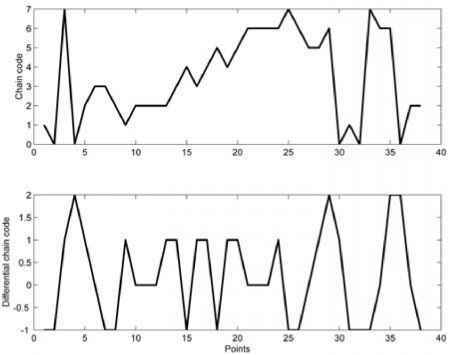 (Top) The plots show the filter in the spatial domain: the real part (left) and the imaginary part (right). It can be appreciated that the real part can be viewed as a line filter and the imaginary part an edge filter. The color coding is green, positive real, red, negative real; blue, positive imaginary, and orange, negative imaginary. (Bottom) The left plot shows the magnitude of the filter with the phase of the filter color coded. 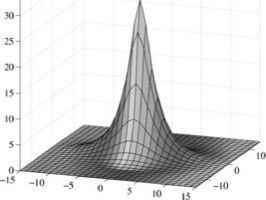 The right plot shows the quadrature filter in the Fourier domain. 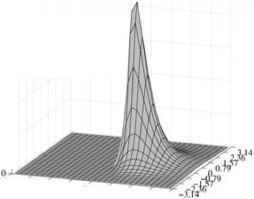 Here the filter is real and zero on one half of the Fourier domain. See also Plate 2.
where Nk = nknT are the outer products of the filter directions. 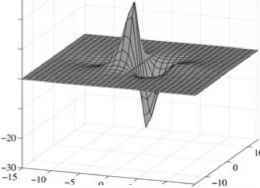 The number of fixed filters needed, N(N + l)/2, is the number of independent coefficients in the tensor C, which is described by a symmetric N x N matrix for a signal of dimension N. This gives that 3 filters are required in two dimensions, and 6 filters in three dimensions. The rest of this section is somewhat technical and may be omitted on a first reading.